If you're visiting Maryland, you're not just in the land of the Orioles, but also, the blue crabs. 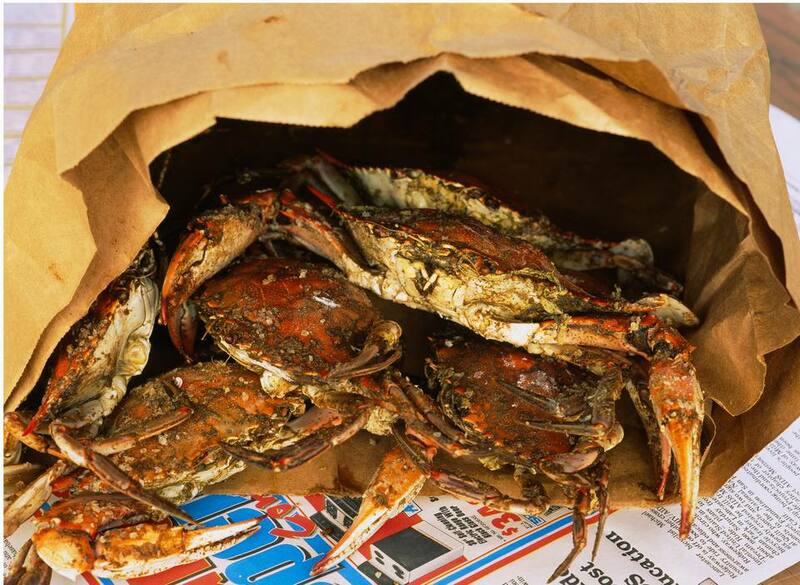 A crab feast in Baltimore—actually, not just Baltimore but all parts of Maryland—is a tradition best served up with beer, some Old Bay seasoning, and tons of paper towels because it's a messy rite of passage. Baltimore is world-famous for its crab houses and the bounty of blue crabs offered up by the Chesapeake Bay. Baltimore boasts crab houses that are fancy and also frills-free. Either way, you will get chest high in crab. So roll up your sleeves and start crackin' that bucket of crabs on your table. A Baltimore institution established in the mid-1940s as a bar in Fells Point, Obrycki's is now synonymous for out-of-towners and locals alike as the crab house of Baltimore. Obrycki's uses their own blend of garlic-based seasoning on the crabs—not Old Bay—and they are delicious just the same. Al's Seafood in Essex has been named the "Best Bargain Seafood Restaurant" by Baltimore magazine, which is a hint that this Baltimore County crab house may not be fancy, but it sure is tasty. Bo Brooks offers a full seafood-heavy menu as well as steamed crabs year round at a waterside location in Canton since 2000. The restaurant is one of Baltimore's oldest crab houses. It was originally founded in 1964, where it was formerly located in the East Baltimore neighborhood of Gardenville. A Baltimore landmark since 1978, Captain James Landing Restaurant has earned the name "most unique eatery" in Baltimore City because it is the only restaurant shaped like a ship. Right on the waterfront, in a prime crabbing location, pair your crabs with some steamed shrimp and a pitcher of beer, and you're set for the night. Family-owned since 1971, Costas Inn serves plump, meaty, tasty blue crabs in a classic old-school Baltimore environment. With its award-winning crabs and Zagat rating, this eatery now ships its famous crab around the country. If you're in town, you'll find they have a lively bar with music some nights. And, if the Orioles or Ravens are playing, the game is on. Sheltered in the quiet waters of Mill Creek, Maryland, just minutes from Annapolis City Dock, the waterside atmosphere makes the crabs feel just plucked from the water. Cantler’s owners and founders, Jimmy and Linda Cantler, are native Marylanders. Jimmy worked as a waterman on the Chesapeake Bay. The Cantler family has worked in the seafood industry for five generations. Casual dining, no pretense. You'll get crabs done right. And, if you come on the weekends, you might be lucky to get a table. It's a nondescript place with all you could ask for as a crab-crackin' experience. From its renovated deck with views of the river adjacent to the Hanover Street Bridge, Nick's Fish House has one of the most beautiful waterfront spots in the city. Get your mallets ready for hot, steamed Old Bay crabs. You can order oysters on the half or chowder, and all the other seafood favorites that make Nick's a great choice for lunch or dinner, year-round.